It's 1997, and we're sitting around the table - Linda Currie, Alex Meduna, Charles Miles and I - talking about combat just like we have for the previous two days and probably will for the next few. It's been back and forth like this for weeks now, a move here, a move there, and for all intents and purposes, we might as well be playing a death-match, marathon-session of D&D. From the outside, it wouldn't look much different. There are notes all over the place, coffee cups, half-full sodas and a collection of stuff-not-good-for-you ordered from Milano's Pizzeria. We look tired, and we are, but we're also having an amazing amount of fun. Somehow, through a wonderful act of longevity, passion and fate, we're making a new game in the Wizardry series. Wizardry 8, to be precise. It is truly a defining moment in all our careers, and for me especially. I've been with the series since 1982, but never before have I taken such a prominent role as a designer, and never before have I felt such responsibility, such risk and such potential reward. There is a game to this game we are playing: the game design game. It has all the hallmarks of multiplayer co-op games: choices, shared goals, alliances and a tremendous struggle toward a successful endgame. I'm not the only designer who feels this way. 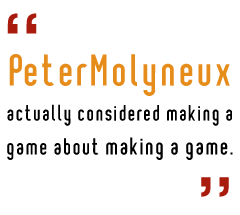 Peter Molyneux actually considered making a game about making a game. "The whole process of coming up with an idea, pitching it, getting a team together, making the prototype, convincing the team it's a good idea through to showing it to the press and seeing how many people post on your boards is so much like a game its uncanny," he told me. Kloonigames went one step further and actually made The Truth About Game Development. We even have our own version of a leaderboard, except it's called GameRankings.com. Peter had better idea. "As for your final score," he said, "you could multiply the number of copies sold by the average review percentage you receive." Sam Lewis, a designer at Cartoon Network who has worked on everything from tabletop games to MMOGs took my metaphor a bit further. "The development process has all of the elements that make a good game - meaningful choices, constantly evolving challenges and an incremental reward cycle. Most importantly, development is like a game, because you do it for fun. You aren't going to get rich." For Mark Nelson at Big Huge Games, the game design game begins and ends before development proper even gets rolling. "I think my favorite part of design is locking myself in a room with two to three other designers and hashing out story, plot, character, whatever. The process of throwing idea after idea at the wall and seeing what sticks is pure fun. And whenever you find that perfect plot point - the one that magically works with all the other elements you've already decided you need, that somehow fills a bunch of the unfillable holes, that was hiding there the whole time waiting to be discovered - you've just beaten the game."